Have a permit to run a motorboat, if needed. Explain the rules or laws that apply to recreational boating in your area or state. Discuss how the hazards of weather and heavy water conditions can affect both safety and performance in motorboating. Promise that you will follow BSA Safety Afloat guidelines. Explain the meaning of each point. Discuss with your counselor the nautical rules of the road and describe the national and your state's aids to navigation. Explain and show the correct use of equipment required by both state and federal regulations to be carried aboard a motorboat. Explain federal and state rules for a ventilation system, and tell why these rules are required. 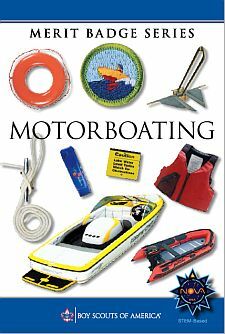 Explain the use of lights (sight signals) and sound signals on motorboats. Discuss the common types of anchors used in motorboating and under what conditions each would be preferred. Explain proper anchoring techniques. Fuel the boat and complete a safety check. Get under way from dockside or from a beach launch. Stop and secure the boat in position on the open water using anchors.Raise and stow the anchor and get underway. Land or dock the boat, disembark, and assist others in doing the same. Moor, dock, or beach the boat and secure all gear.